(left to right) Paul Pouliot, Denise Pouliot and Grace Dietz at an internship presentation. When it comes to telling the stories of indigenous people in New Hampshire, the “official” history — found on historical site markers, in text books and on public murals, among other places — only tells part of the story. Grace Dietz ’17 learned that firsthand during an internship this semester with Paul and Denise Pouliot of the Cowasuck Band of the Pennacoook Abenaki People. Dietz was the first student intern to work on a long-term collaborative project between the Pouliots and the anthropology department to reframe Granite State history from an indigenous perspective by mapping indigenous sites of cultural and historical significance. A slide of the story map's homepage. Dietz, an anthropology and international affairs major, worked with the Pouliots on a “story map” of New Hampshire’s indigenous history. The project combines the latest maps with text, images and multimedia content to create a narrative that spans thousands of years and hundreds of miles. “We see this as a great start to telling the history of New Hampshire in a broader sense and not just a colonial perspective,” Paul Pouliot said. 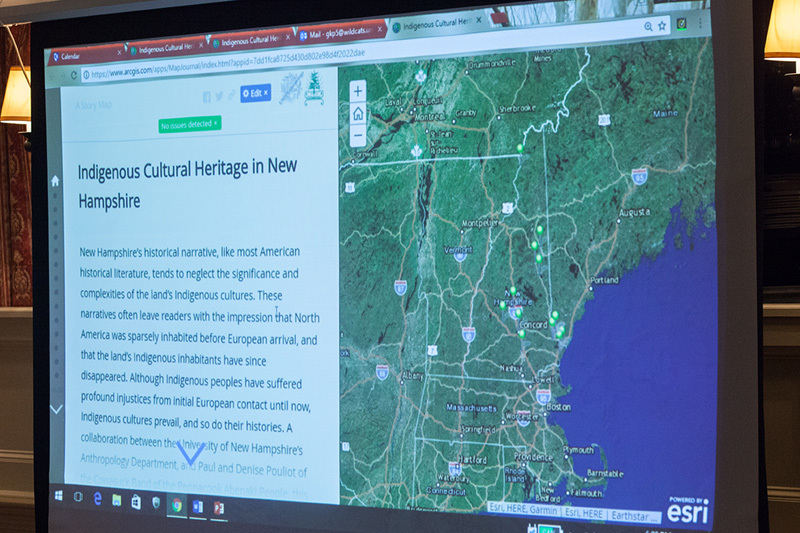 Using archival research and interviews with Paul and Denise Pouliot, Dietz created a story map highlighting more than a dozen locations important to indigenous history throughout New Hampshire. Explore the map and you’ll find entries on Abenaki chief Joseph Laurent, whose 1884 book “New Familiar Abenakis and English Dialogues” was the first Abenaki-English dictionary. That same year, Laurent opened the Abenaki Indian Shop and Camp in Conway as a way to capitalize on tourism in the area and give members of the Abenaki community a place to sell items and trade stories. Other entries examine the tales surrounding the naming of Mount Chocorua, legends about the creation of Amoskeag Falls (located in what’s now Manchester) and the 1689 raid on Cocheco (now known as Dover). 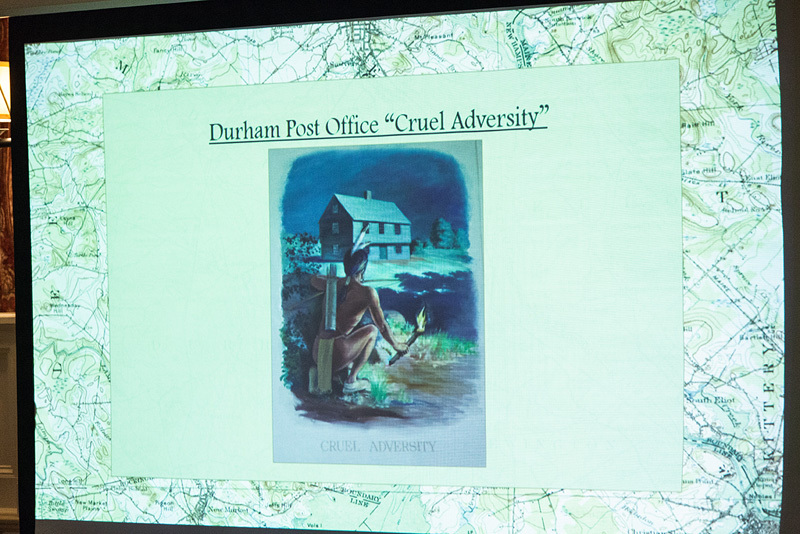 A slide of a panel in a Durham Post Office mural. Reading the marker and looking at the mural reduces Native peoples to a flat stereotype and minimizes the complexities of history, Dietz said. Rather than explaining the complicated social, political and environmental relationships between indigenous people and English and French settlers, items like the mural and marker overly simplify and obscure history. Sventlana Peshkova, associate professor of anthropology, is guiding the collaboration between the Pouliots and the university. In 2016, Peshkova received one of the UNH Center for the Humanities’ first Publicly Engaged Humanities Fellowships to develop student internships in cultural heritage. Dietz hopes other students will carry on the work she started with Paul and Denise Pouliot. There are hundreds more important locations, events and people in New Hampshire to document, along with hundreds of misconceptions and stereotypes about indigenous people to dispel. “The goal of it is to make the information more accessible to the public — there’s no point in keeping it within academia. This is just the beginning of getting everyday people to think about history more critically,” Dietz said. Students, faculty, staff and administrators attended Grace Dietz's internship presentation.